Wednesday January 30, 2019-Former Vice President, Kalonzo Musyoka, continued to face rebellion in Ukambani after a section of County legislators from Machakos County Assembly snubbed his meeting, dismissing it as "musical chairs". Instead, the 17 MCAs held an alternative meeting at the Maulice Hotel, Machakos, where they called out the wiper leader and asked him to retire from active politics and let their Governor, Alfred Mutua, take the mantle of Ukambani leadership. 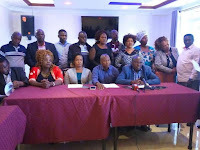 "We have heard of some desperate moves by the Wiper leadership convening a meeting in an attempt to revive Hon Kalonzo's diminishing political career," Minority Whip, Alex Kamitu, noted while reading their joint press statement. The MCAs dismissed Kalonzo's move to rally people from Ukambani to support his 2022 Presidential bid, noting that nothing good would come out of the meeting. "Nothing much will come out of it. We have been through these musical chairs before," he continued.